Sindoni, Maria Grazia;Wildfeuer, Janina; Kay L. O'Halloran (eds. 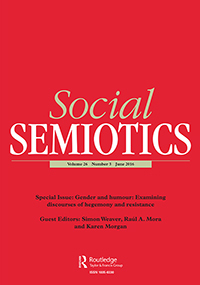 ): Special Issue of Social Semiotics: The Languages of Performing Arts: Semiosis, Communication, Meaning-Making. Social Semiotics 26 (4), 2016. The Languages of Performing Arts: Semiosis, Communication, Meaning-Making.